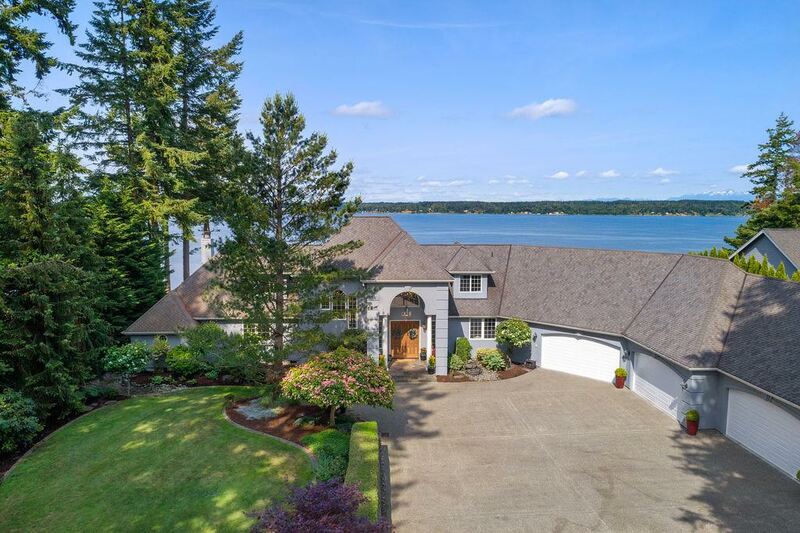 Boasting panoramic views of the Puget Sound and the Olympic Mountains, this one-of-a-kind gem is tucked away in the exclusive gated Horsehead Bay community in Gig Harbor. Discover this home’s long list of sumptuous amenities, from the palatial 4,240-square-foot layout that includes 4 bedrooms and 3.5 baths, to the idyllic 2.09-acre property that includes 140 feet of pristine beach access. 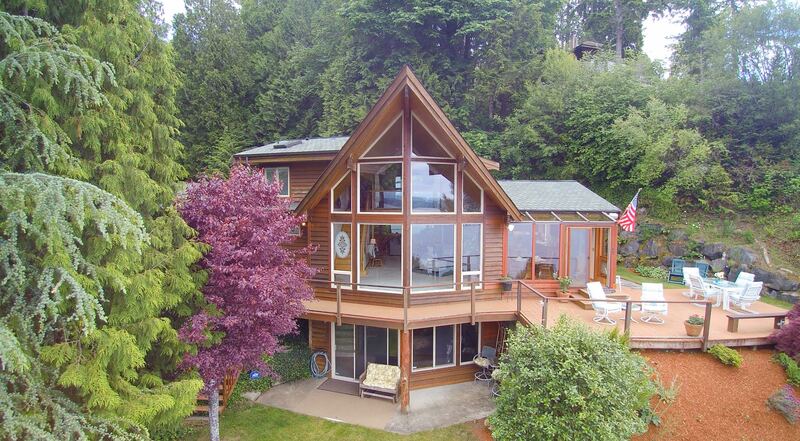 Located at 3016 115th Ave NW Gig Harbor WA 98335, this 1994-built masterpiece is listed for $2,075,000. When you drive up to this splendid residence, a huge 6-car garage and a striking entryway make for a delightful first impression. The front door opens up to reveal waterfront living at its finest, and the layout seamlessly flows from one well-appointed space to another. 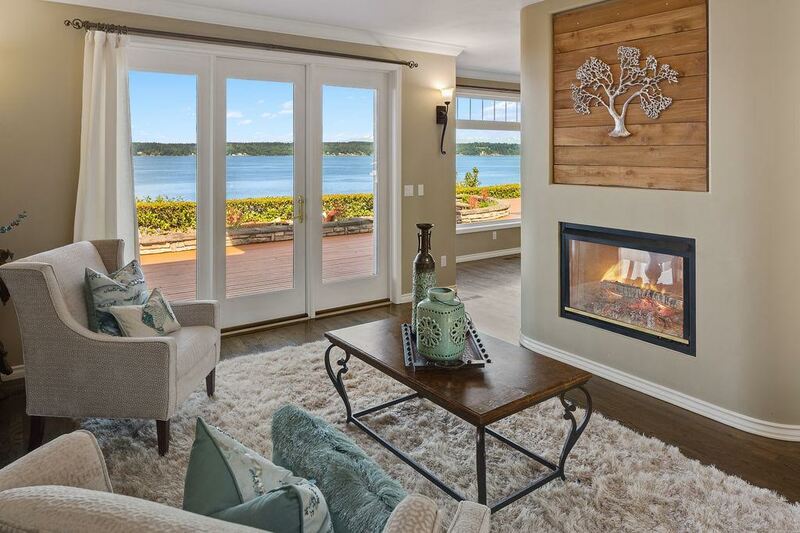 The main floor shows off expertly designed living spaces that include 2 cozy fireplaces and exquisite built-ins, all with captivating views of the Puget Sound. A wall replete with shimmering windows not only bathes the space in cheerful natural light, but ensures you can take advantage of this home’s premium vantage point. This residence’s epicurean kitchen ensures that entertaining is effortless, whether you’re whipping up a holiday feast or simply sipping a glass of wine at bar-style counter seating. 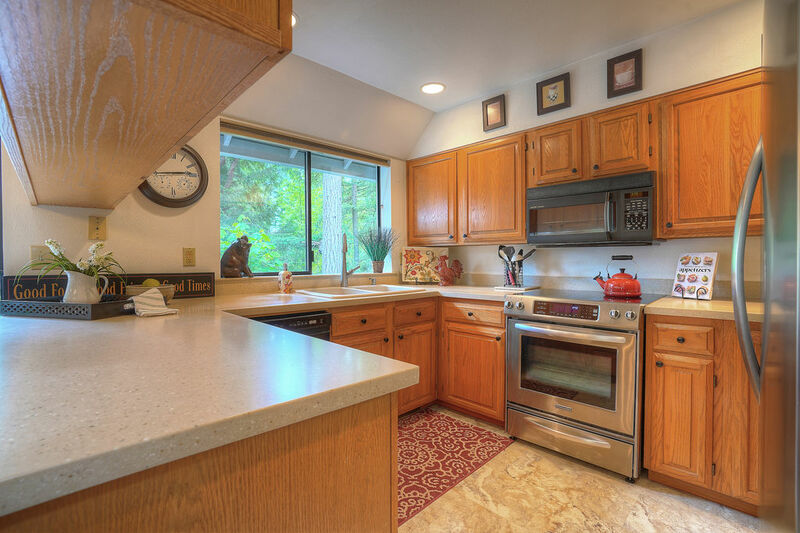 Granite counters, a sub-zero fridge, sleek appliances (including a wine fridge! ), and tons of storage make for a remarkable blend of top-notch efficiency and stylish elegance. The formal dining room is the cherry on top, and here you’ll discover a sophisticated atmosphere complete with a fireplace, in addition to even more incredible views. 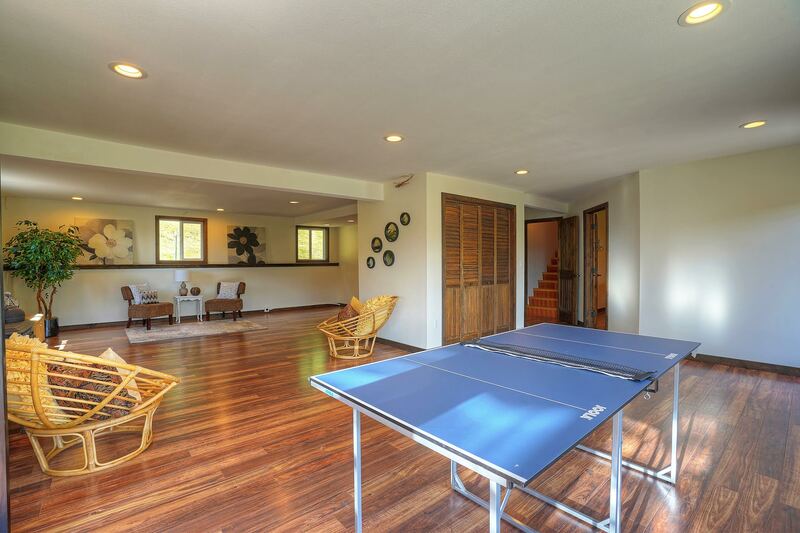 This home’s generous 4 bedrooms each boast resort-worthy amenities, and no expense has been spared. Overnight guests are in for a treat no matter which room they unpack their bags in, but the main floor master suite is the true crème de la crème. Imagine waking up to views of the Sound and the Olympics, and basking in the warmth of the fireplace, all without having to leave the indulgent comfort of bed! The layout includes a huge walk-in closet, and also flows into the ensuite bath, a sumptuous retreat with 5-star spa amenities. A large bonus room with eye-catching ceiling beams can also be found upstairs, and this versatile space is ideal for an entertainment center or indoor recreation area. Find wall-to-wall cabinets perfect for a tv display or a home theater system, and natural light that cascades in through a generous wall of windows. This estate’s outdoor offerings are just as dreamy as its indoor amenities, and you’ll find a regulation-sized tennis court in addition to idyllic entertaining options. Whether you’re hosting al fresco meals on the huge deck or exploring the beach, the benefits of waterfront living can be found at every turn. A moorage buoy can be used spring through autumn, and you can head out for a kayaking adventure whenever you please! 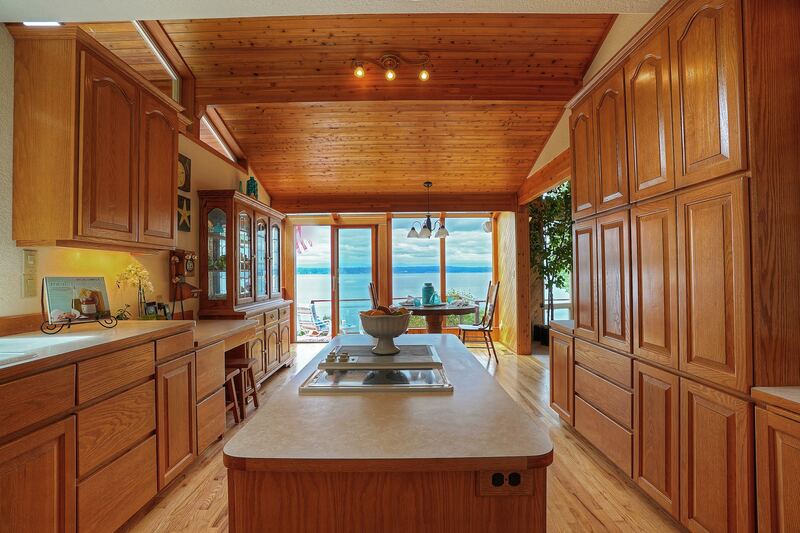 The life you’ve always envisioned for yourself awaits in Horsehead Bay! 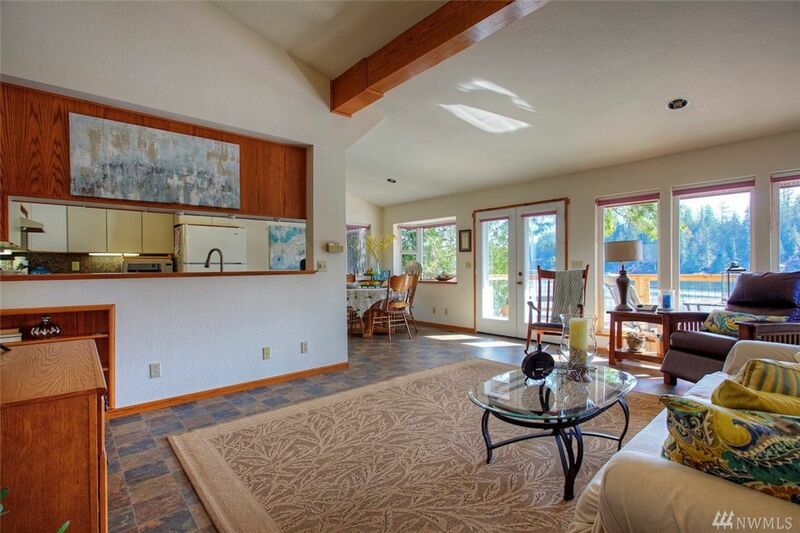 At 3016 115th Ave NW Gig Harbor WA 98335, you’re not far from outdoor opportunities and city conveniences! Whether you’re exploring the 112-acre Kopachuck State Park (only 9 minutes away) or playing a round of golf at Gig Harbor Golf Club (only 10 minutes away), you’ll find plenty of ways to stay active close to home. Highway 16 is only a 14-minute drive from home, and both Downtown Gig Harbor and Uptown Gig Harbor are conveniently only a 15-minute drive away! Whether you need to run errands or just want to head out for a relaxing day of shopping and dining, you don’t have to travel far to take advantage of all that Gig Harbor has to offer. 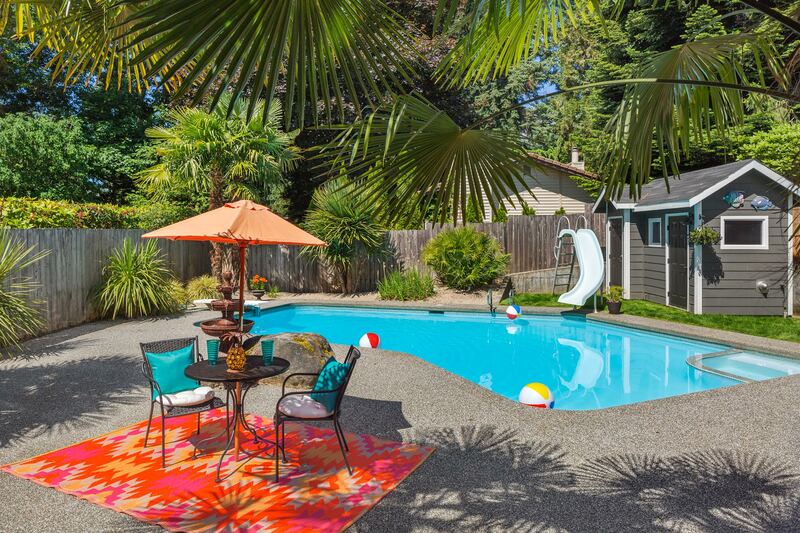 Summertime bliss awaits with this private oasis in Gig Harbor! 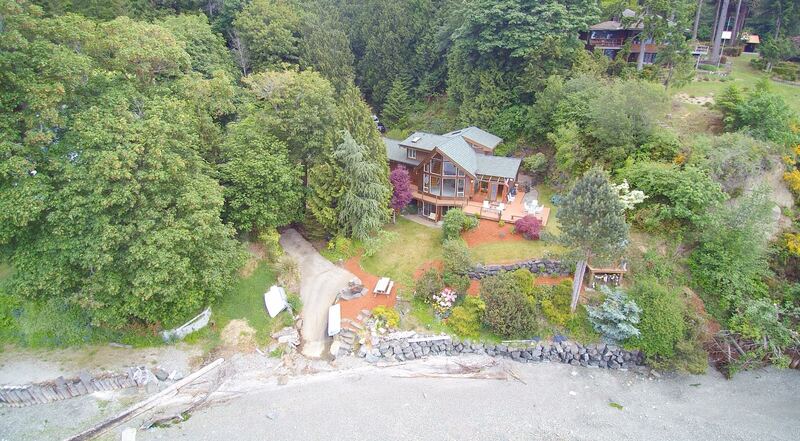 Enjoy this secluded slice of paradise while being in a desirable neighborhood just seconds from the Narrows Bridges and minutes to Downtown Gig Harbor. Additionally, this 2,453-square-foot home showcases an extensive remodel! 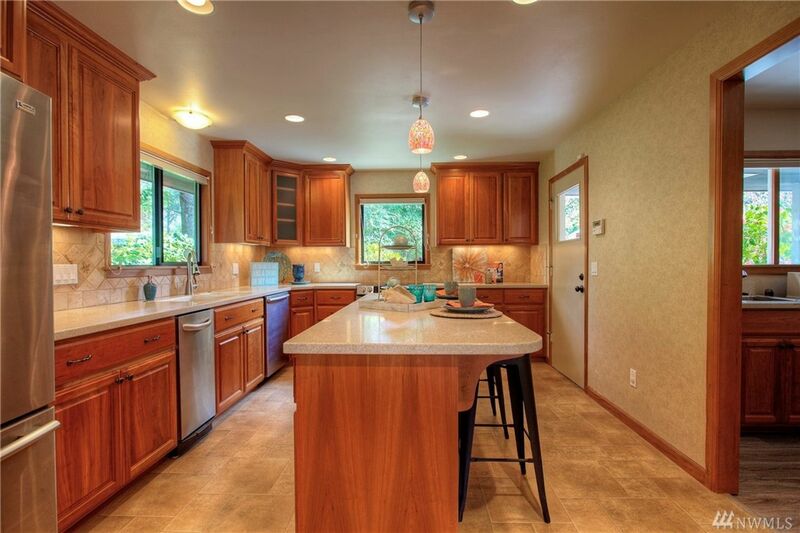 Located at 2222 Aqua Vista Ct NW Gig Harbor WA 98335, this 4-bedroom, 2.5-bath home is listed for $725,000. Nestled on 0.28 acres of beautifully cultivated land, this home’s fabulous outdoor setting offers resort-ready amenities right from the comfort of home-sweet-home. A sprawling patio is ready for weekend barbecues and summer parties galore, and guests can sunbathe, go for a refreshing swim in the pool, and unwind in the spa. Palm trees instantly transport you into summer vacation mode, and it’s hard to beat the view of the pristine, crystal clear pool! This 1976-built home boasts an extensive remodel, and the attention to details throughout is truly impressive. Discover delightful elements like exotic hardwoods, imported vanities, attractive walls of reclaimed brick and wood, custom cabinetry, and more, all for a dynamic blend of captivating classic and modern styles. In the front living room, cheerful sunlight pours in through large windows, and a fireplace promises cozy evenings spent snuggled up on the couch. The warm color palette just adds to the inviting feel of the space, and evenings spent entertaining guests or just relaxing watching tv are both at home here! The layout seamlessly flows into the huge gourmet kitchen, an impressive space with rich cabinetry, impeccably maintained counters, sleek appliances, and eye-catching light fixtures that add a splash of fashionable flair to the space. Light cascades in through a large skylight, shining the spotlight on this truly remarkable haven of efficiency! 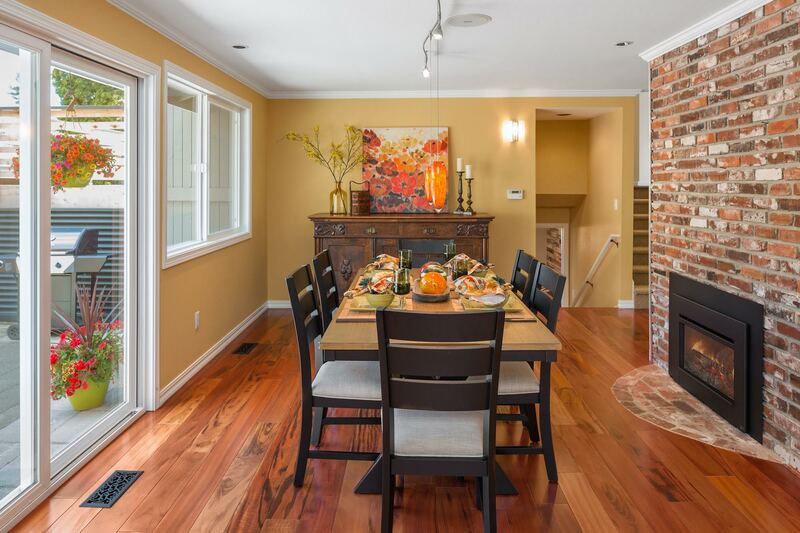 The adjacent formal dining room features the other side of the living room’s fireplace, and the gorgeous brick makes for a stunning statement wall. Plus, plenty of room for a full-sized dining table ensures you’ll have room to host a crowd! An additional living area includes its own kitchenette, offering the potential for a guest suite with its own entrance. 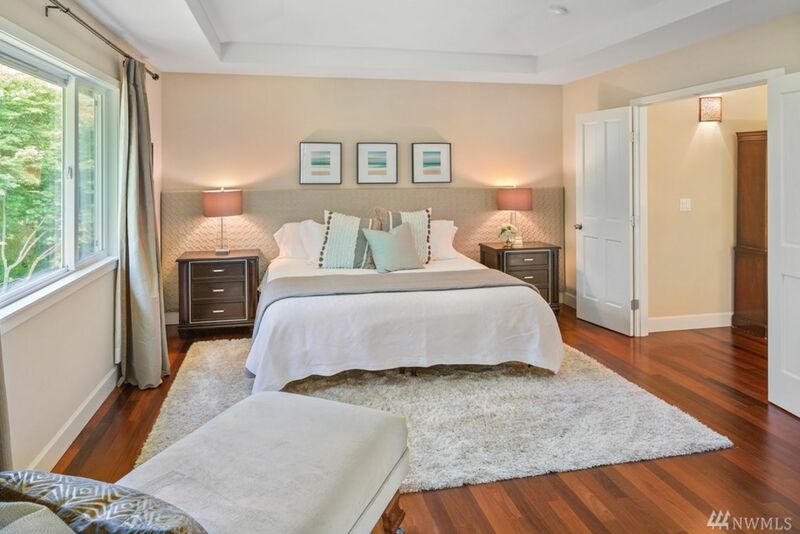 This home’s 4 bedrooms promise loved ones their own private space to retreat to, and the master suite is a noteworthy highlight. Not only can you enjoy direct deck access and a large layout with room for a sitting area, but tons of built-in closet space and a stunning ensuite bath is in the mix as well. 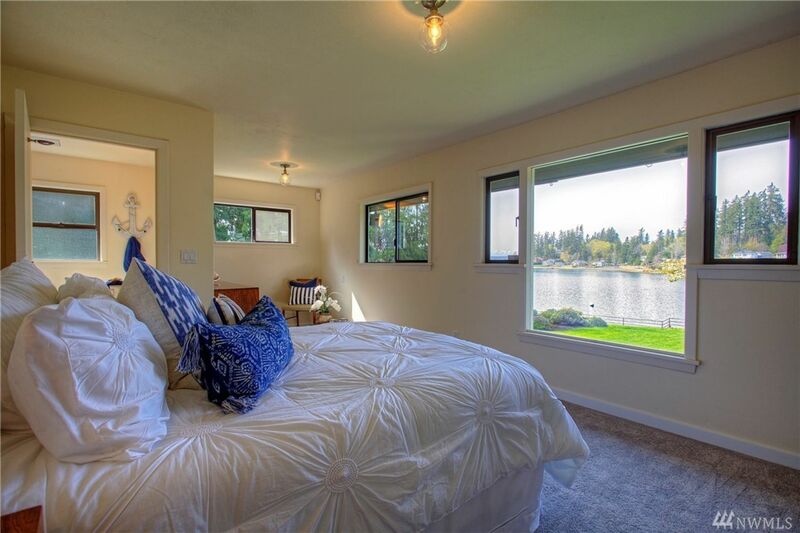 At 2222 Aqua Vista Ct NW Gig Harbor WA 98335, your location really cannot be beat. From here you’re only 2 minutes away from connecting to Highway 16, and the Narrow Bridges are right there, making it easy to hop on over to Tacoma and back. Both Tubby’s Trail Dog Park and the Performance Golf Center are practically in your backyard at only .3 miles away, making it easy to stay active. Uptown Gig Harbor is a short 6-minute drive away, and Downtown Gig Harbor is a quick 8-minute drive—it’s a breeze to run errands, go shopping, grab a bite to eat, and so much more! Tucked away in a secluded setting on a stunning 1.26 acres, this spacious 2,760-square-foot residence is an absolute dream to come home to! In addition to the serene outdoor setting, this home’s indoor amenities promise easy living at every turn. Discover 4 bedrooms, 2.75 baths, comfortable living spaces, a 2nd kitchen downstairs, plus a long list of thoughtful updates that include new floor coverings, new paint, and new light fixtures. 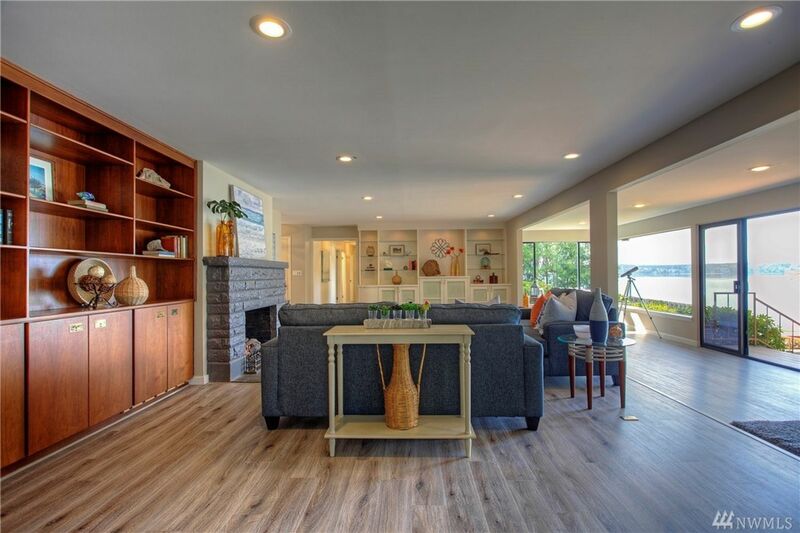 Located at 7207 63rd St Ct NW Gig Harbor WA 98335 and close to top-rated schools, parks, Highway 16, Downtown Gig Harbor and more, this move-in ready home is listed for $497,500. When you arrive home, an extra-long driveway leads you past mature trees and lush greenery into your very own private slice of paradise. 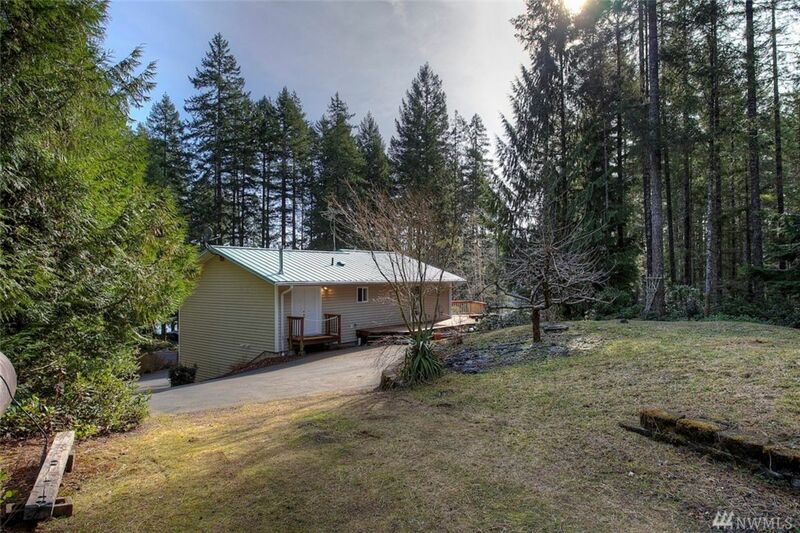 Surrounded by Pacific Northwest beauty, this home feels miles away from it all while still being wonderfully close to city conveniences! A path from the front winds its way around the home to the backyard, past tranquil, low-maintenance landscaping to a covered patio and spacious deck. Perfect for hosting lively weekend barbecues or just sunbathing as you take in a view of it all, this gem’s outdoor scene promises years and years of memories and relaxation! Head inside to find a haven of comfort, and in the main floor living room, natural light pours in through large windows, while a fireplace promises cozy evenings in this warm and welcoming space. 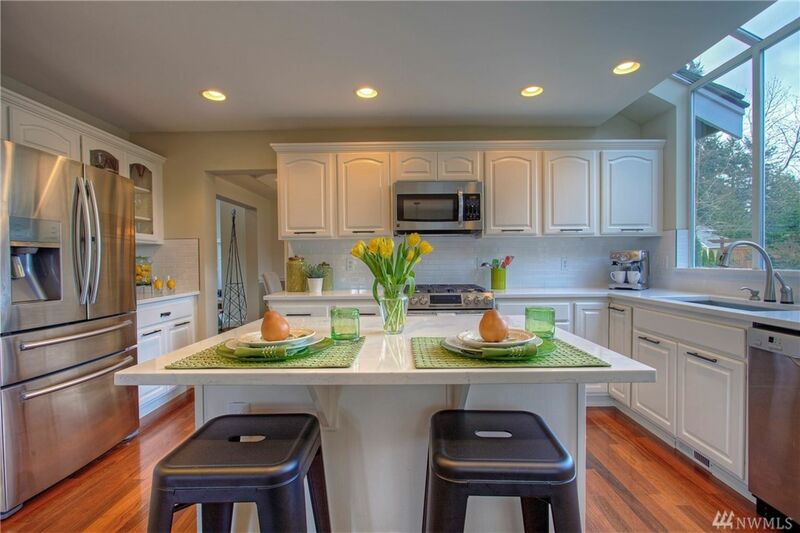 The layout effortlessly unfolds into the dining nook and kitchen, an inviting space with smart design. In the kitchen, find ample storage for kitchen essentials in handsome cabinetry, and large counters that make meal prep as easy as possible. Views of the scenic outdoors beckon at every turn, just contributing to the cheerful atmosphere! A main floor master suite offers convenience, and this peaceful sanctuary with high ceilings is ready for rest and rejuvenation. Bright sunlight cascades in through a skylight, and the ensuite bath (complete with updated lighting and flooring!) and walk-in closet ensure all that you need is within reach. The lower level family room, additional bedrooms, and the second kitchen can all be found downstairs, brimming with potential and versatility. If you’re searching for an extended living option or perhaps Airbnb potential, the perfect scenario with a separate entrance can be found on the lower level. You might also consider transforming any extra space into a fitness center, a hobby room, office, library, or recreation center. 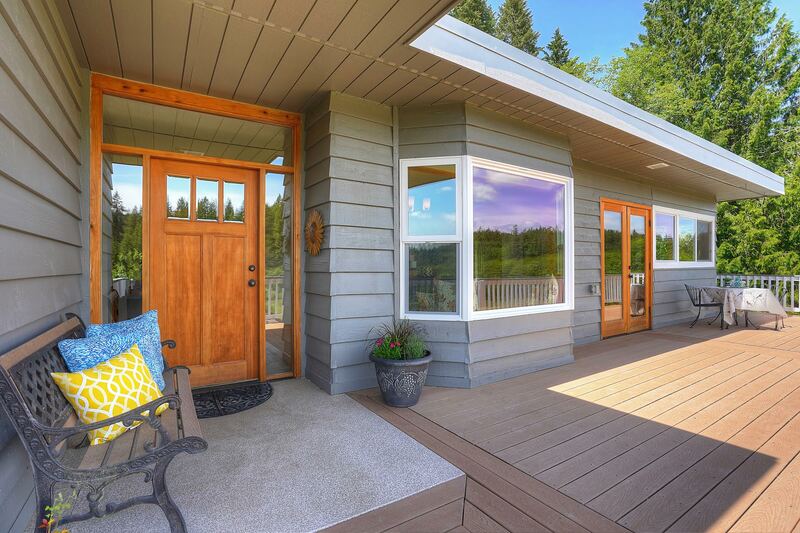 Whichever you may choose, this Gig Harbor gem is just waiting to be infused with your own ultimate vision of home! 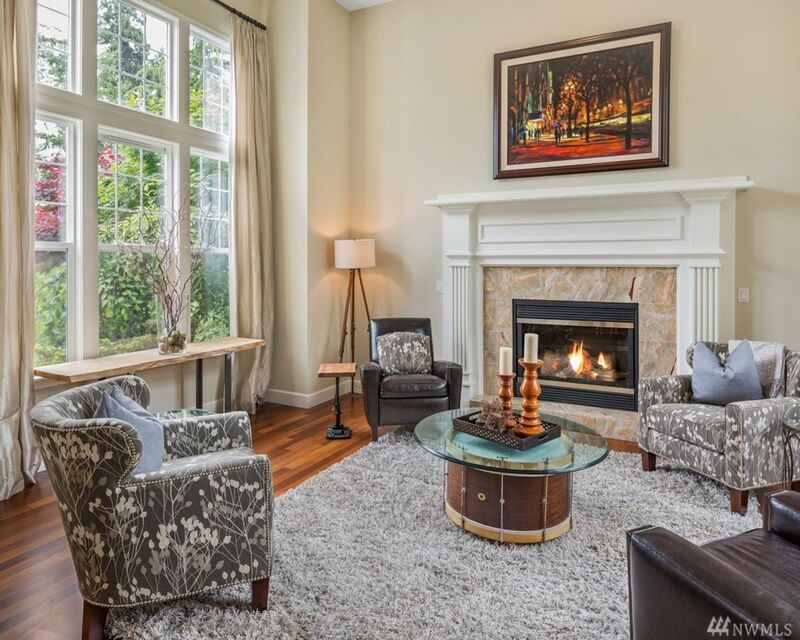 At 7207 63rd St Ct NW Gig Harbor WA 98335, you’re in a gorgeous private setting while still being surrounded by Gig Harbor’s best amenities. Top-rated schools, parks, shopping, restaurants, transit options, outdoor opportunities, and more are all just minutes away. 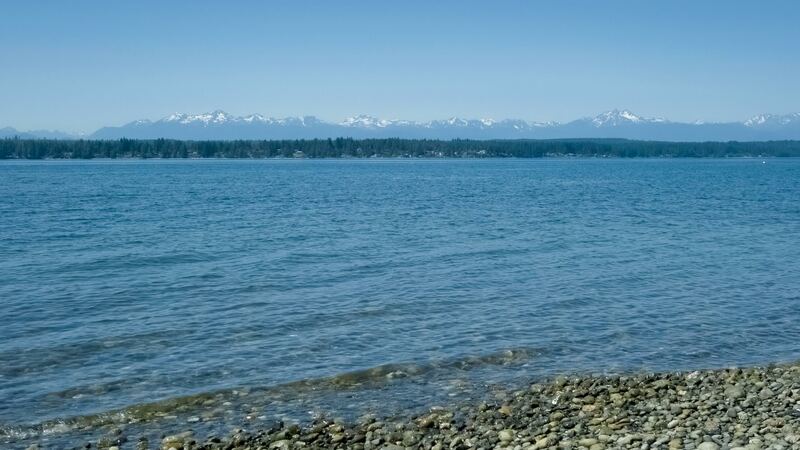 When you’d like to spend time outdoors, the Gig Harbor Golf Club is only a 7-minute drive from home, and Kopachuck State Park is only an 8-minute drive away. Enjoy being only 5 minutes from being able to hop on Highway 16, and only 7 minutes from being in the heart of Downtown Gig Harbor! Discover waterfront living at its finest with this estate-sized property in Vaughn! Nestled on a private 8+ acres in a gated community, this stunning 3,061-square-foot home offers many amenities (including a sauna!). Enjoy vacation-worthy living, all while taking advantage of 125-feet of bulk-headed low-bank waterfront. 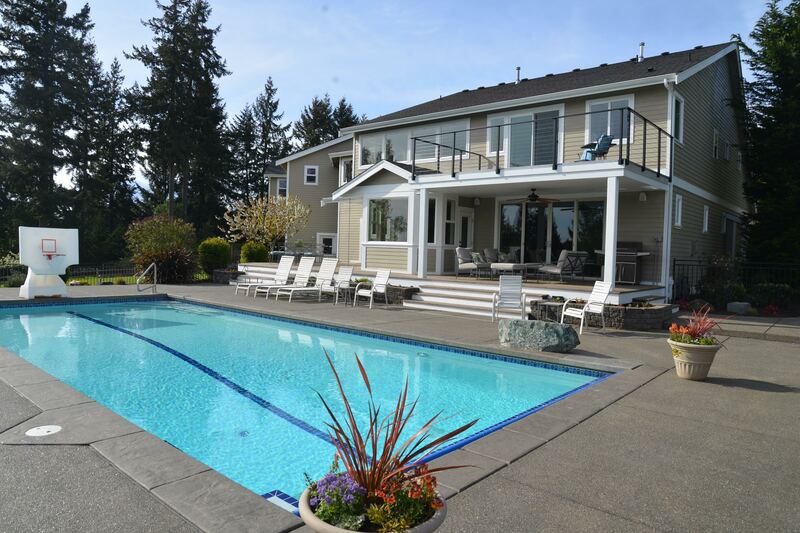 Located at 18907 70th St Ct NW Vaughn WA 98394, this 3-bedroom, 3.5-bath estate is listed for $895,000. Drive through verdant greenery and mature trees to reach this secluded home, and as you wind down the driveway, get ready to feel wonderfully miles away from it all! 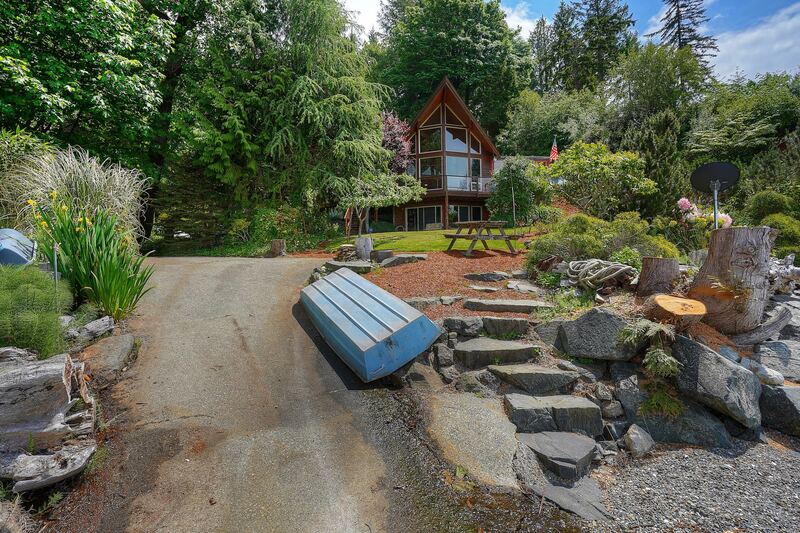 This home’s colorful landscaped yard stretches on toward the beach, where you’ll find a small boat ramp (get ready for afternoons spent kayaking!) and the perfect scene for beachcombing and digging for clams and oysters. 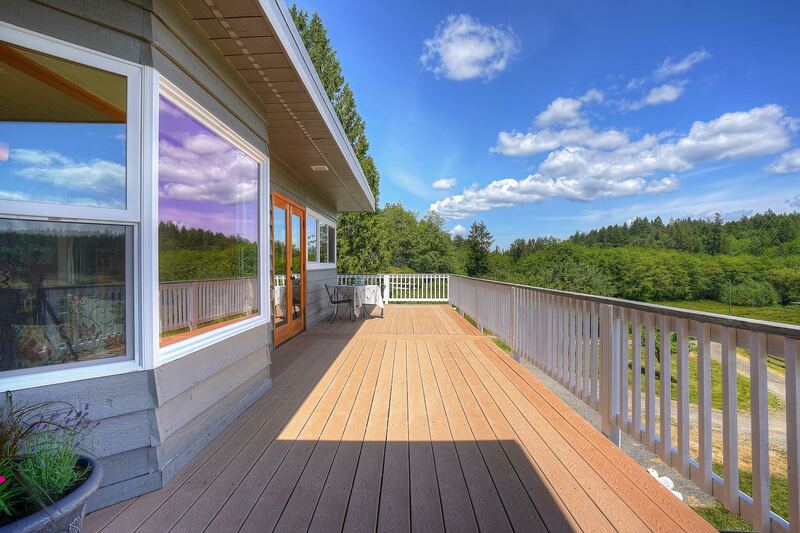 Take in the view from the picturesque gazebo or the expansive deck, all while enjoying sweeping views of the Olympic Mountains, the shimmering water, and photo-ready sunsets! 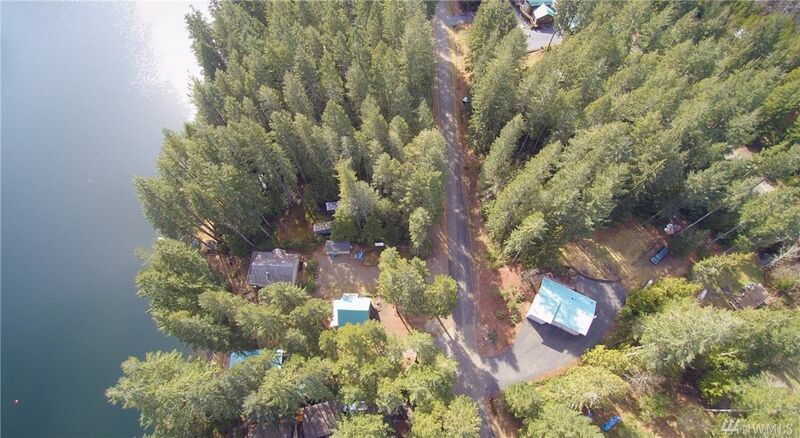 In addition to this property’s idyllic storybook setting, you can be sure you have plenty of space to spread out on, and a 850-square-foot RV/boat garage and full RV hookup are also in the mix. Head inside to find an interior that’s just as impressive as this property’s outdoor delights. 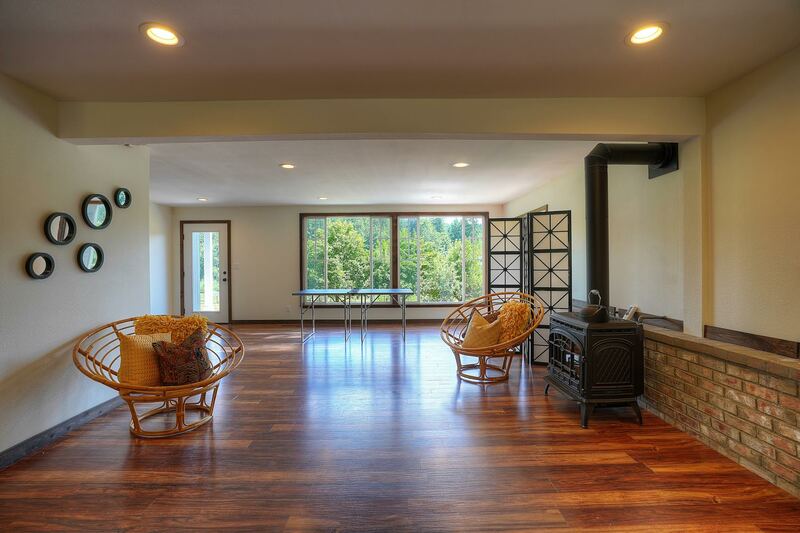 In the main living room, stunning floor-to-ceiling windows bring the outside in, and western exposure promises that sundrenched days of relaxation are in your future! Infused with natural wood elements throughout, this home offers a cozy lodge-inspired aesthetic with ample opportunity for entertaining. 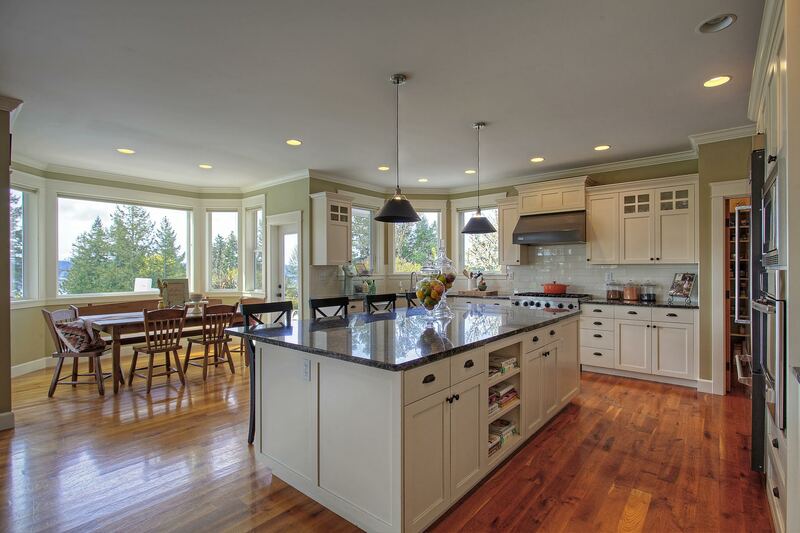 The layout seamlessly flows into the kitchen and dining nook, where an inviting scene awaits. Thoughtfully designed and brimming with efficiency, in the kitchen you’ll find generous cabinetry and counter space, plus a center island and a built-in desk that just add to the top-notch function of it all. 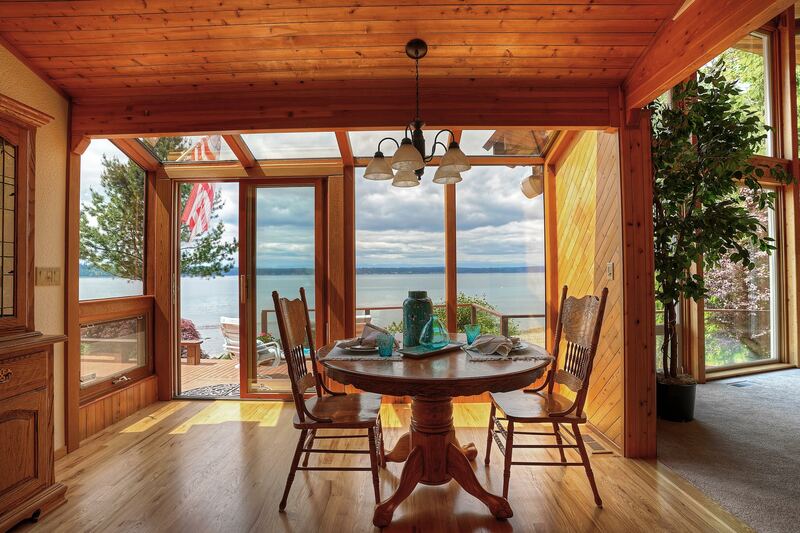 Whether you’re serving up a home-cooked meal or simply enjoying a laid-back cup of coffee, the dining nook offers a welcoming scene, with the same incredible waterfront views that can be enjoyed throughout the entire home. Cheerful light cascades in, creating a warm glow that makes this residence a magical place to call home! Journey upstairs to find this home’s master suite, a sumptuous haven that includes its own private deck with clear railing for unobstructed views into the lush scene beyond. 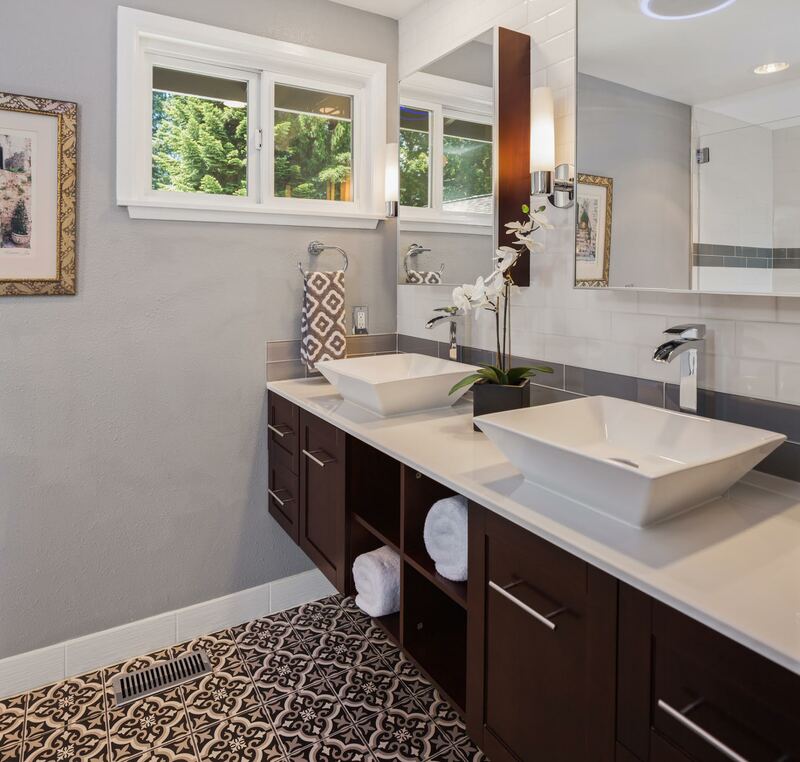 There’s also a fabulous 5-piece bath at your fingertips, with vaulted ceilings and spa-inspired amenities. 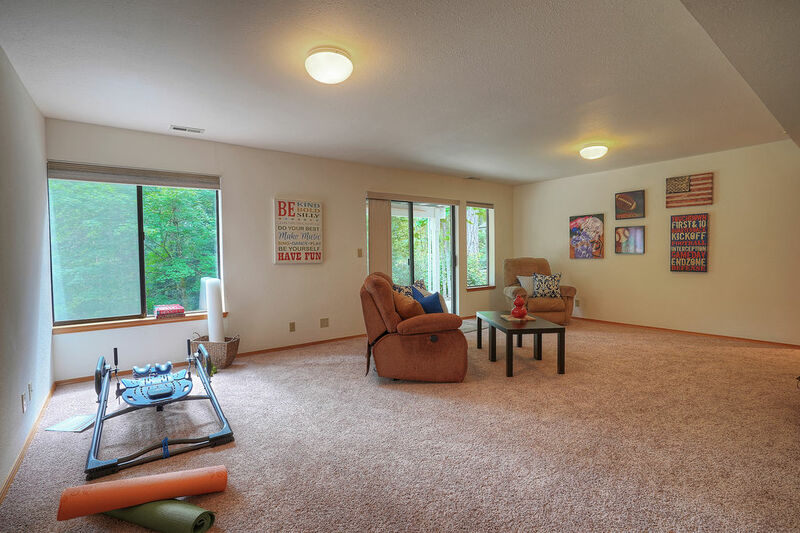 In the home’s lower level, even more space awaits, including an additional bedroom and a dynamic recreation room. For ultimate rest and rejuvenation, a sauna is also in the mix—unwind and enjoy this spa-worthy amenity from the comfort of your own home! 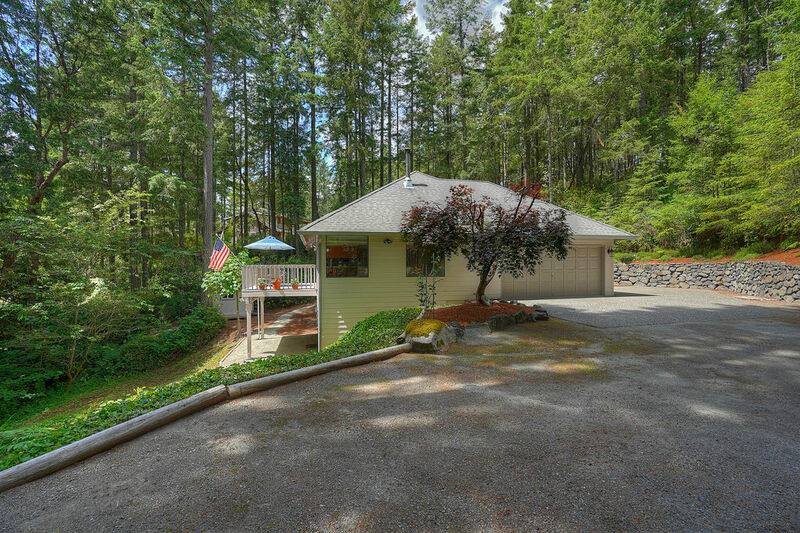 Located at 18907 70th St Ct NW Vaughn WA 98394 just west of Gig Harbor, Vaughn is a small community along the water in Pierce County. At its center is a Community Center with tennis courts and a playground. Just minutes to Key Center where you can grocery shop, visit the doctor, go to the hardware store or buy flowers at the gardening shop. Treasured for its more rural atmosphere and easy waterfront access, there are plenty of opportunities for spending time in nature. Vaughn is conveniently right along Highway 302, which makes it easy to connect to Highway 16. Magazine-worthy style, premium amenities, and top-notch convenience are wrapped up into one luxurious package with this custom-built masterpiece! 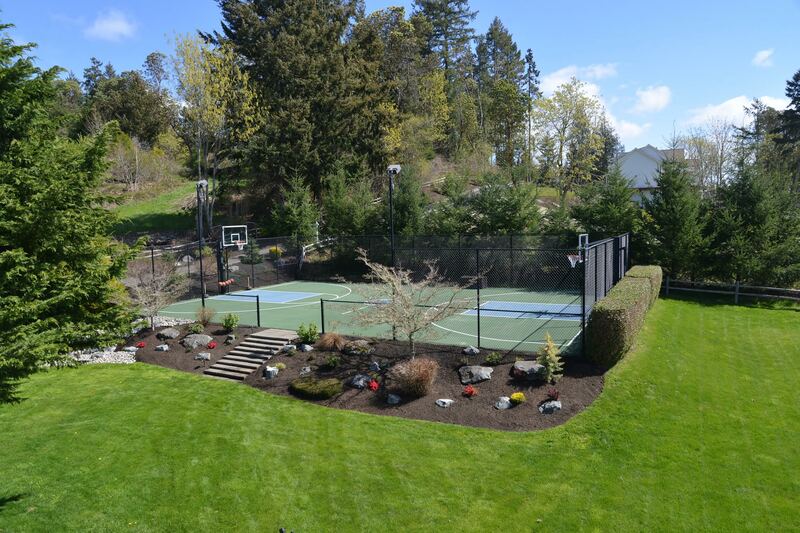 Nestled on an incredible 7.06 acres in the desirable Cromwell community, this property not only includes the 5,068-square-foot luxury home, but also features an in-ground pool, a huge sport court, and views of the Puget Sound and mountains in the background! 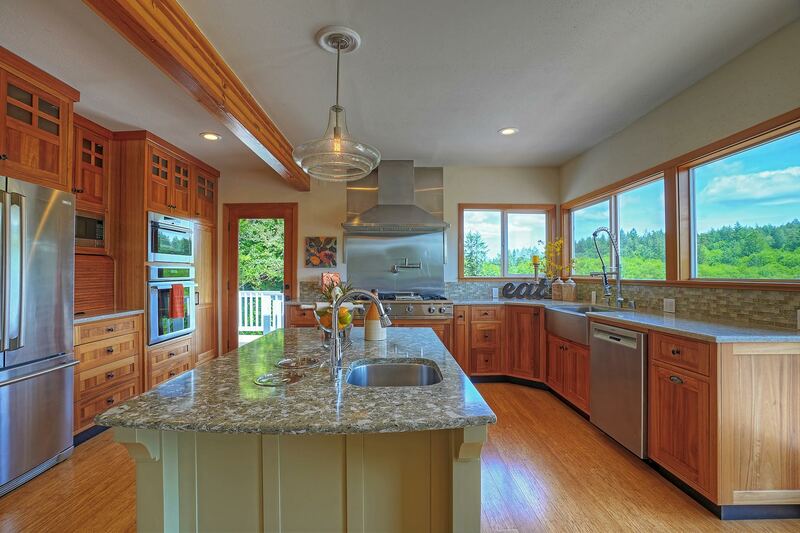 Located at 1830 56th Ave NW Gig Harbor WA 98335, this 5-bedroom, 4-bath home is listed for $1,420,000. 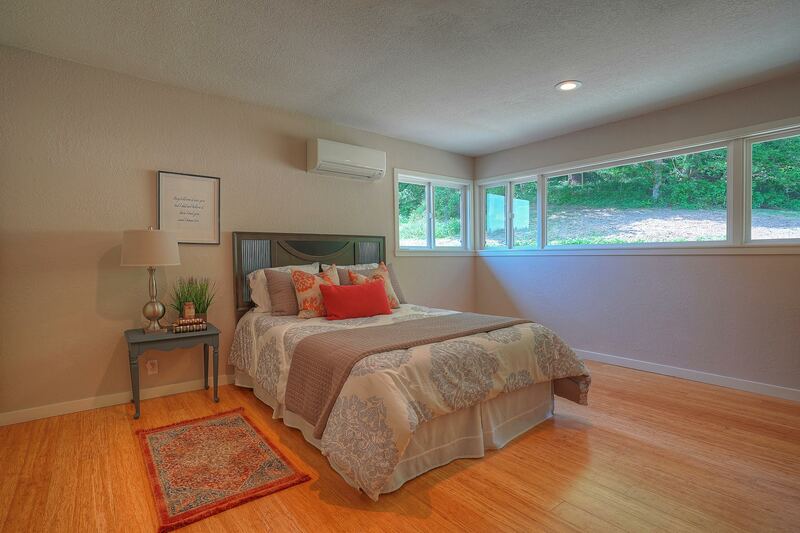 Built in 2004, this move-in ready residence has been immaculately maintained over the years. An extra-long driveway leads to this home’s picturesque exterior, and when you step inside, the palatial layout welcomes you in! 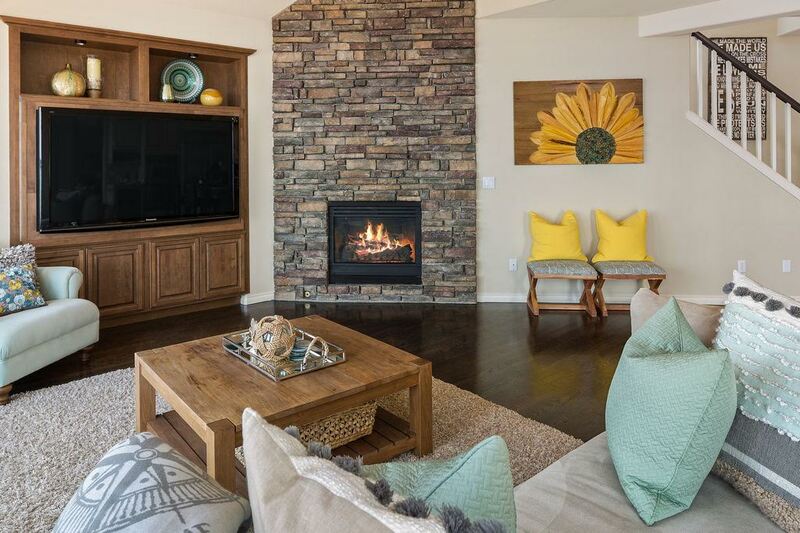 Immediately to the left you’ll find a cozy living area, with a majestic fireplace surrounded by eye-catching built-ins. Continue on toward the back of the home, and the great room promises to become the center of daily life. The living area showcases a gorgeous brick-accented fireplace, neat built-ins, and walls replete with windows fill the entire great room with bright natural light! The layout seamlessly flows into the entertainer-sized chef-ready kitchen, a haven characterized by elegant style and efficient design. 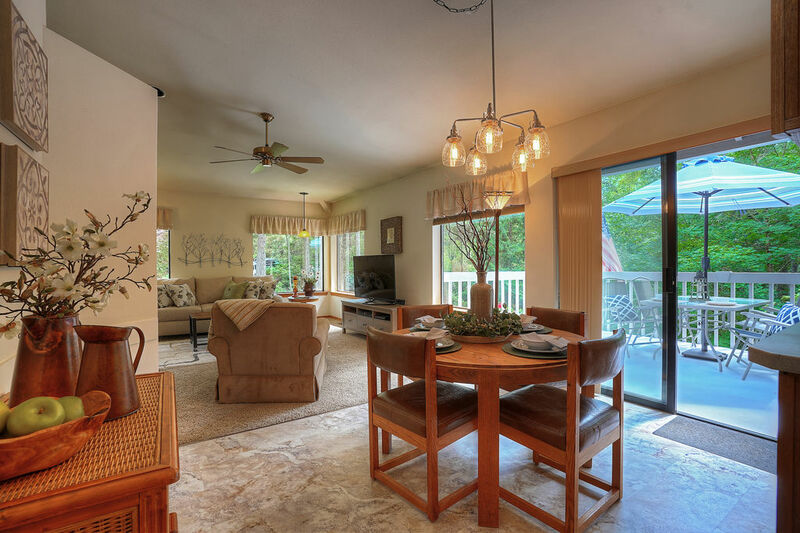 Viking appliances, a walk-in pantry, and a large island are just a few of the standout features, and you’ll find plenty of seating at the island, in the adjacent dining nook, and in the formal dining room around the corner. Pristine wainscoting, captivating light fixtures, and exposed wood columns elevate this sophisticated space, ensuring you’re ready to host dinner parties, special occasions, and holiday get-togethers all year long! In addition to an office area, laundry space, a huge bonus room, and a loft area with built-in desks and a window bench, this home’s sprawling floor plan also includes 5 bedrooms and 4 baths. Each room has been thoughtfully designed and curated, and no expense has been spared in ensuring each private retreat features the very best. The resort-inspired master suite is a sumptuous treat, and it not only features vaulted ceilings and extra-large windows that show off the view, but it also boasts a jaw-droppingly stunning walk-in closet, a spa-ready ensuite bath, and private access to a deck that overlooks the 7+ acres that are all yours! When the weather warms up, this property is brimming with opportunities for play, relaxation, and fun. A large in-ground pool offers the ideal summer hangout and a convenient way to get in a good workout, all without having to leave the comfort of home. The same is true of the fenced-in sport court—enjoy weekends spent playing basketball, pickleball, tennis and more! 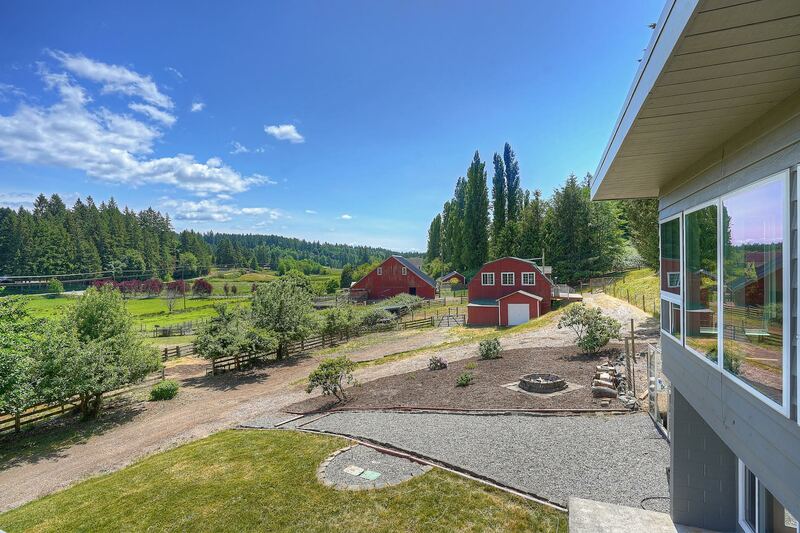 At 1830 56th Ave NW Gig Harbor WA 98335, you’re nestled in the highly desired Cromwell community, tucked amid superb schools and in a neighborhood of luxury acreage properties. 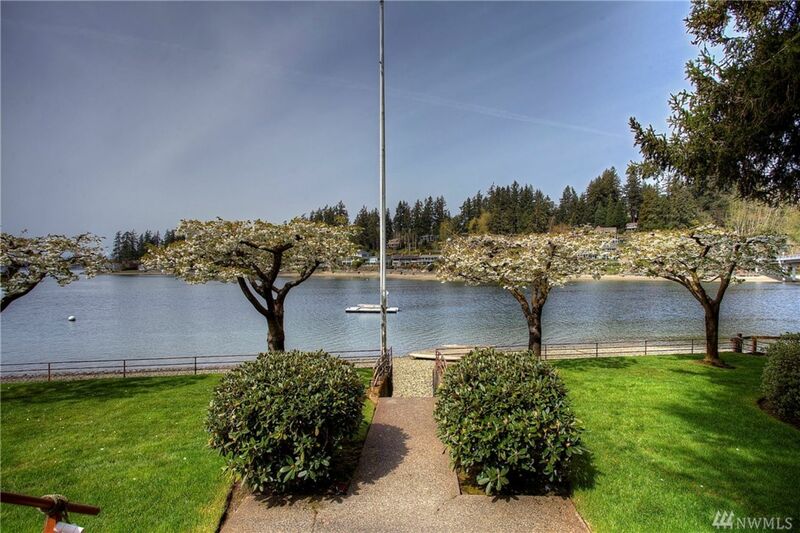 The waterfront is at your fingertips, and golf enthusiasts will appreciate being so close to Gig Harbor Golf Club and Madrona Links Golf Course. You’re also only an 11-minute drive to Highway 16 and Uptown Gig Harbor, a one-stop shopping center where you’ll find grocery stores, shops, restaurants, entertainment, and much more! Dreams come true with this sweet retreat that includes 100 feet of low bank waterfront property on scenic and peaceful Haven Lake! Water ski or kayak right off of your private dock, gather around the lakefront fire pit as the sun goes down, and take advantage of the huge garage and additional building with a shop and loft area—all of this and more offers the flexible space and premium amenities for vacation-worthy living. This stunning property offers 2 homes with 2 bedrooms/1 bath each for a total of 2,072 square feet. 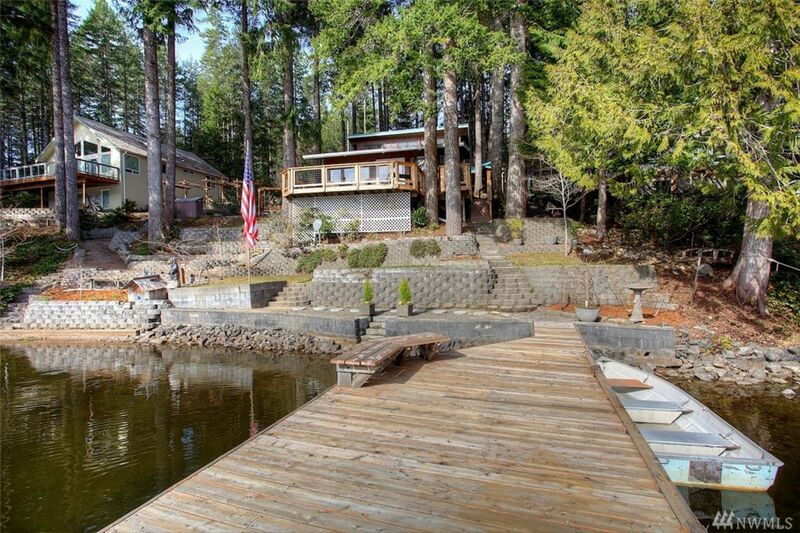 Located at 182 NE Lake Dr, Tahuya WA 98588 and just 10 minutes from Belfair, this rare residence is listed for $612,000. 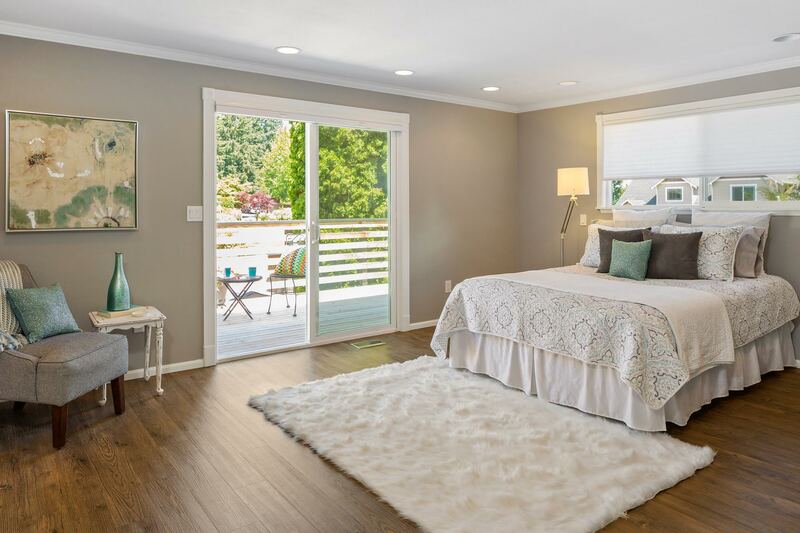 Nestled in a picturesque oasis surrounded by mature trees and lush greenery, this home’s storybook setting provides the ideal getaway, whether you live here full time or simply stop by for the summer. 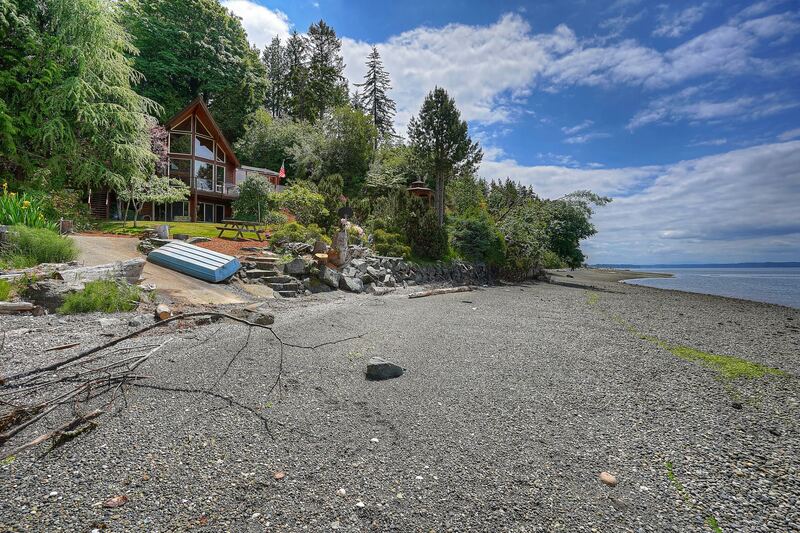 A large dock helps you to take advantage of the 100 feet of lowbank waterfront, and a charming path winds its way past neatly arranged rock walls and up to the main home. An expansive deck overlooks the idyllic scene, and here you’ll find the perfect perch for relaxing or hosting weekend barbecues! 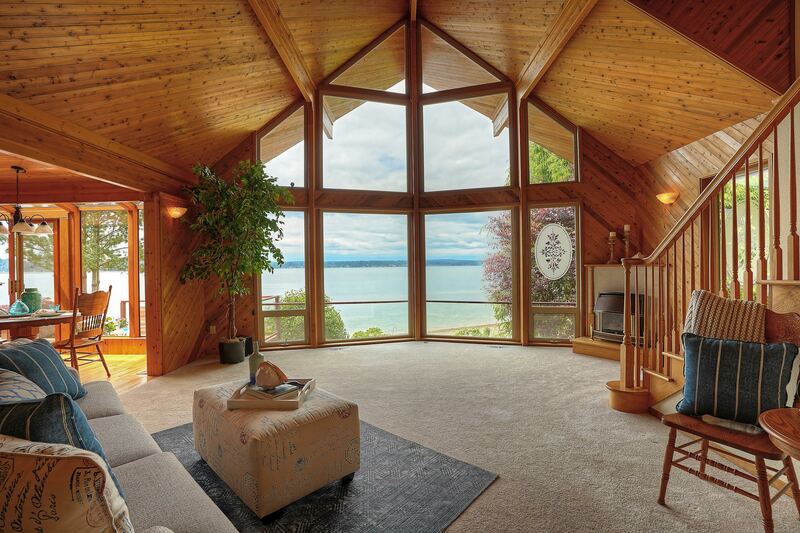 In addition to photo-ready views of the lake, the rest of the property is a joy to discover. The 2nd home includes a huge dream garage boasting 10-foot ceilings, a workshop, and an RV bay, while an additional garage/shop even comes with an upstairs bonus room. Attractive landscaping throughout the property shows off how it has been carefully and lovingly maintained over the years, and the same is true for the main home’s stunning interior! 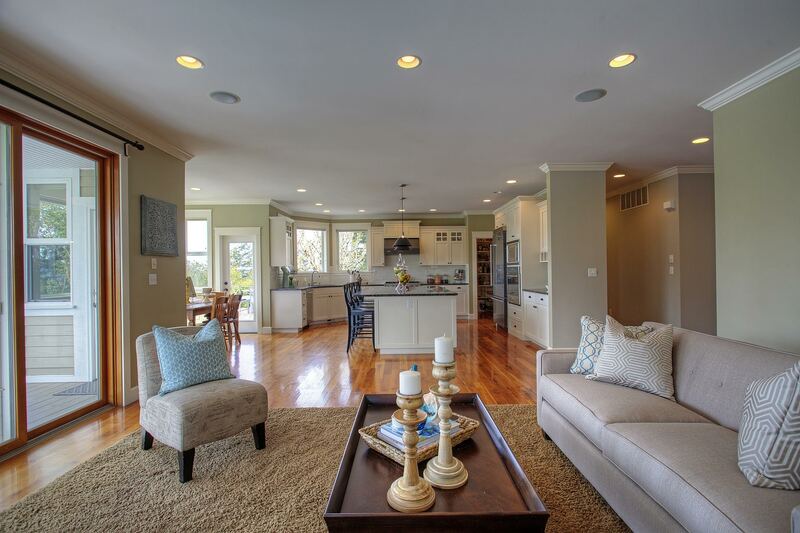 Wonderfully move-in ready, this home’s main living area showcases a welcoming open-concept layout. 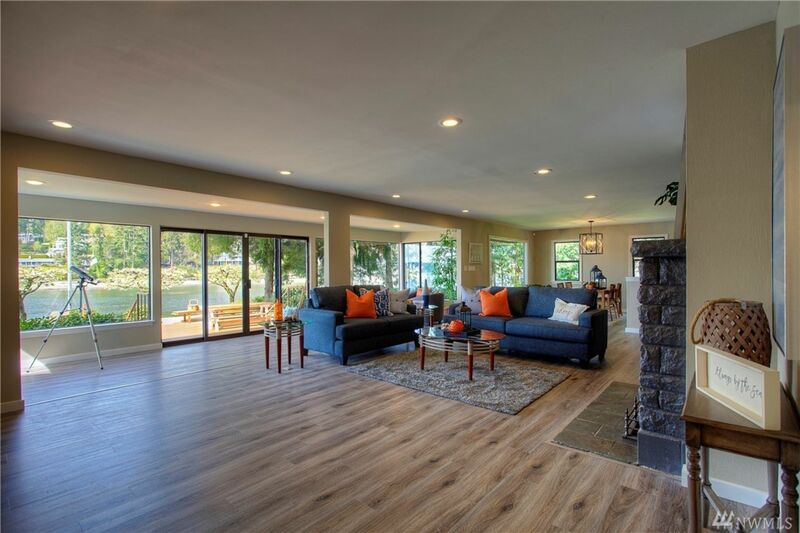 Vaulted ceilings and huge windows create a bright and inviting feel, while a smart floor plan makes it easy to enjoy each space, whether you’re hosting holiday get-togethers or having a low-key gathering among friends. 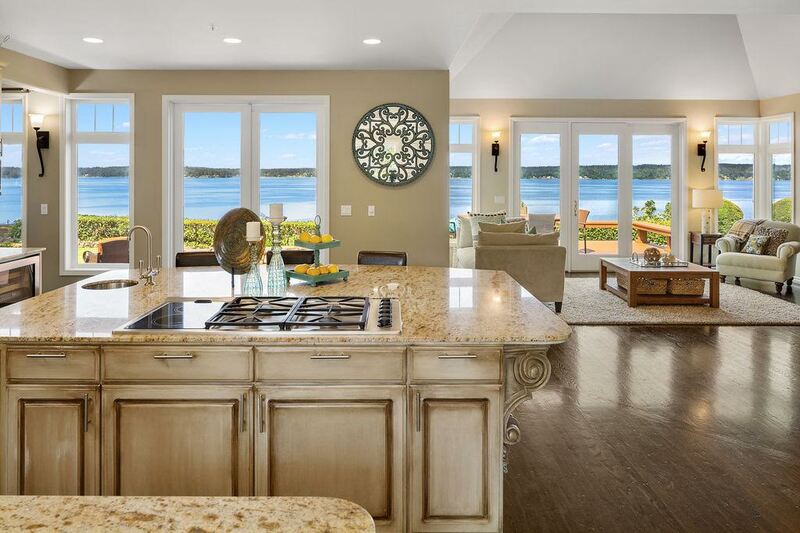 Views of the lake await at every turn, and even in the kitchen while you’re whipping up meals, natural light pours in through this space’s many windows, all while framing the shimmering lake just beyond. The second home on the property provides the potential for a guest house, whether you have a live-in relative or choose to rent it out for some extra income. This pristine space even includes its own full kitchen (with generous cabinet storage space), ensuring guests have everything they need within reach! 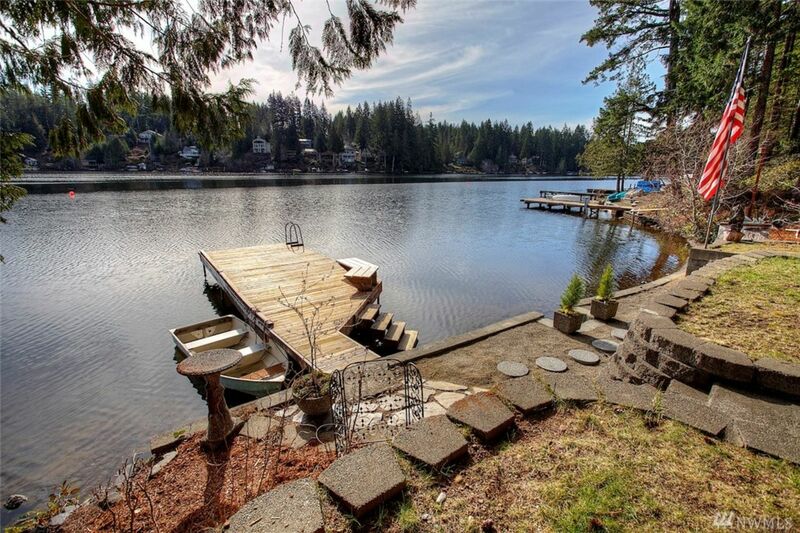 At 182 NE Lake Dr, Tahuya WA 98588, you’re surrounded by the Pacific Northwest’s signature beauty, out among gorgeous forested areas away from the hustle and bustle of the nearby cities. A peaceful drive takes you to nearby Belfair, and here a wide range of city conveniences await. You’ll find places like Starbucks, Safeway, QFC, Rite Aid, Mclendon’s Hardware, and several restaurants and eateries to choose from all in the mix. Luxury living awaits with this exquisite 3,128-square-foot masterpiece! 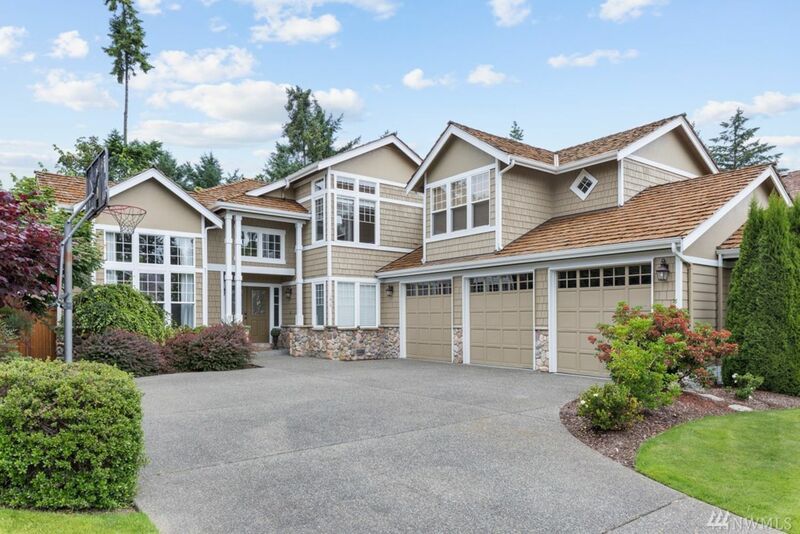 Pride of ownership shines in this impeccably maintained home that is wonderfully close to Uptown Gig Harbor, Highway 16, excellent schools, golf courses, the waterfront and more. Brimming with gorgeous living areas and fabulous spaces designed with entertaining in mind, this 3-bedroom, 2.5-bath home offers ultimate comfort and convenience at every turn. Plus, a park-like backyard with a private patio is your very own outdoor oasis! 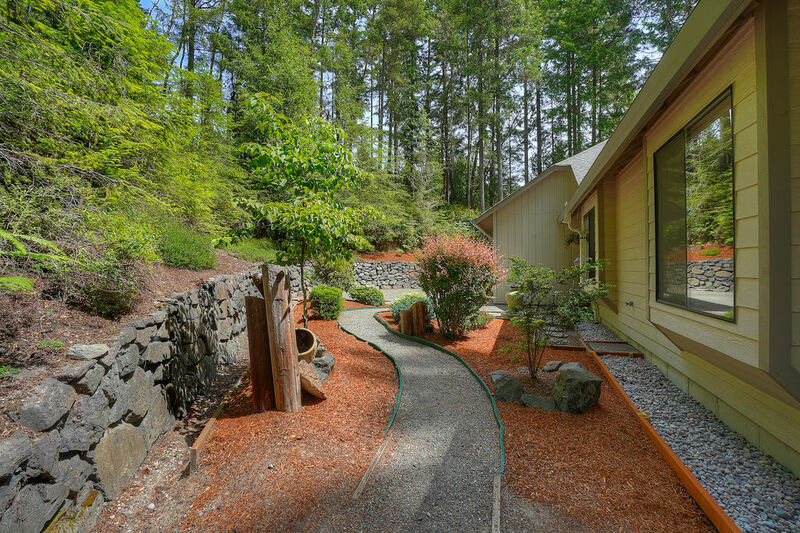 Located at 1615 42nd St NW Gig Harbor, WA 98335, this one-of-a-kind retreat is listed for $650,000. 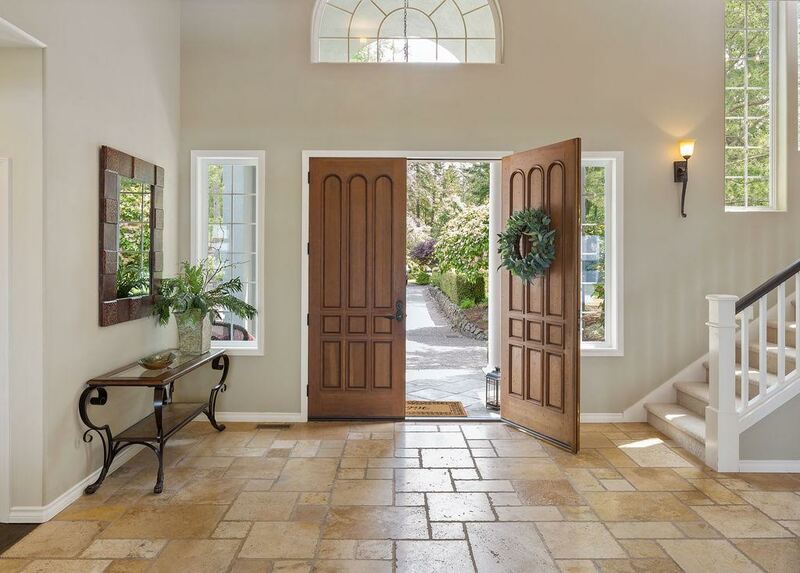 Showcasing magazine-worthy curb appeal, this residence is truly a joy to arrive home to! 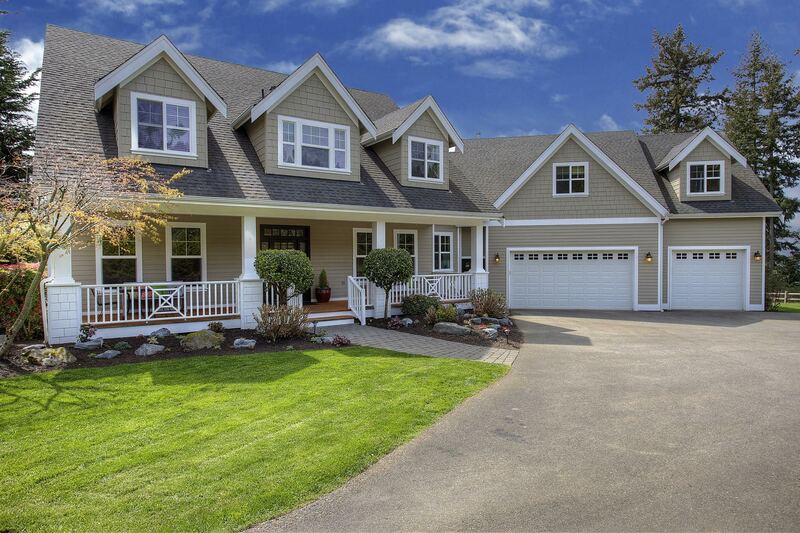 Stunning Craftsman style is reimagined in this contemporary dream, and an extra-large driveway, 3-car garage, meticulous landscaping, and expertly crafted exterior are all wrapped up into one impressive package. 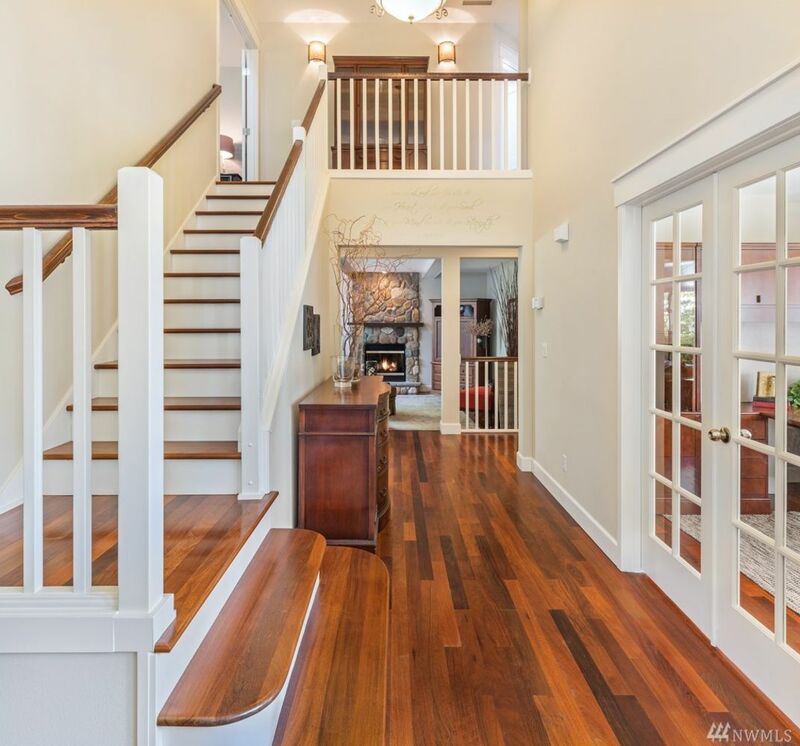 The front door opens up to reveal a magnificent entryway with handsome hardwoods, 2-story ceilings, and an eye-catching staircase that leads the eye upstairs. An entertainer’s dream awaits in the formal living room, a haven filled with natural light that cascades in through tall windows. Soaring ceilings just add to the open atmosphere, while a stately gas fireplace anchors the room. A picturesque blend of light and warmth create a welcoming scene that’s ready to serve as the backdrop for special occasions, holiday gatherings, or get-togethers with loved ones! Another separate living space awaits, showing off even more natural light and a classic stone-accented fireplace. 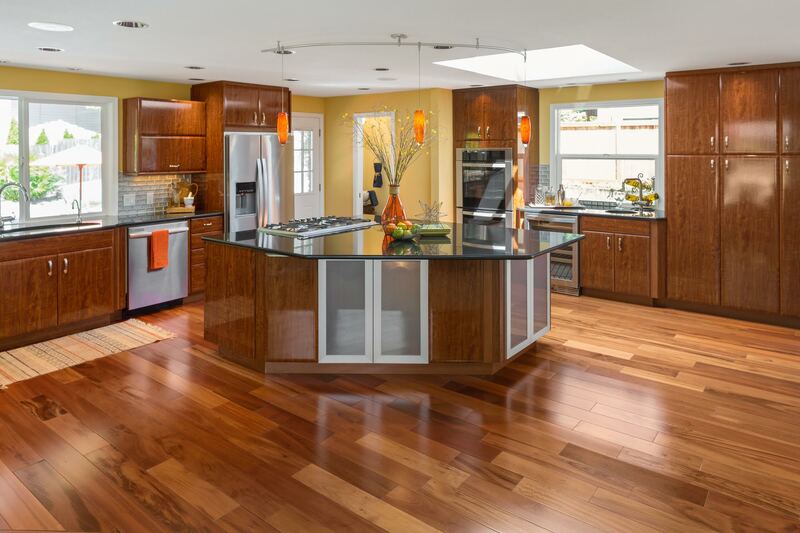 The spacious, open kitchen with its dining nook and huge island are truly the heart of the home! Replete with crisp white cabinetry and a matching backsplash, beautiful new quartz counters, and sleek appliances, the kitchen is a dynamic blend of the best in function and fashion. Enjoy meals at the sunny dining nook, take advantage of convenient bar-style counter seating, or head into the adjacent formal dining room. Find even more space in this home’s office, additional living space, 3 bedrooms, 2.5 baths, and laundry room. Each thoughtfully designed area provides versatility, whether you dream of having an elaborate entertainment setup in the additional living area, or an office that also serves as your own personal library. The sumptuous master suite is also especially noteworthy—a large layout with exquisite ceiling details, a calm neutral color palette, and a spa-inspired ensuite bath round out this home’s stunning amenities! Verdant greenery and neat landscaping await in this home’s backyard paradise, and here you’ll find a private patio, a play toy, a lush carpet of green grass, and opportunity for putting your green thumb to work! Whether you’re hosting a crowd for a weekend barbecue or just relaxing in the sun while little ones play, you can take advantage of this idyllic atmosphere all from the comfort of home sweet home! Plus, you can easily head to the neighborhood park for even more space to play. 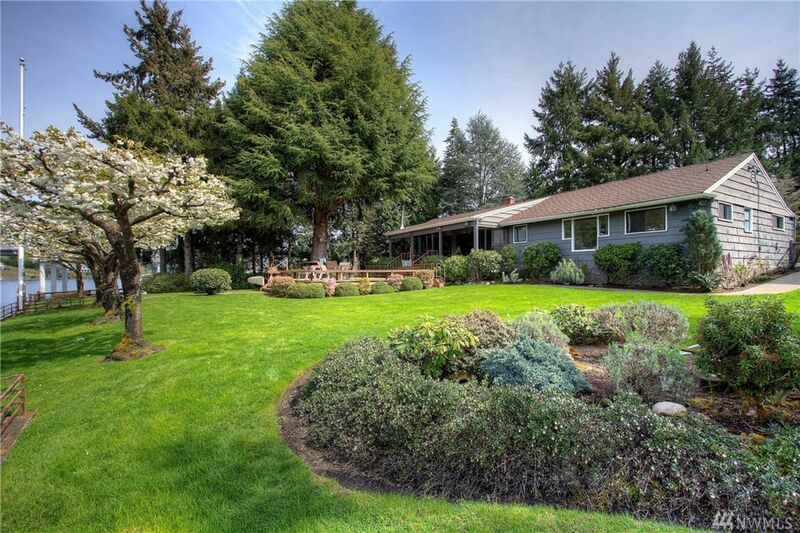 At 1615 42nd St NW Gig Harbor, WA 98335, you’re nestled in an ideal Gig Harbor location. 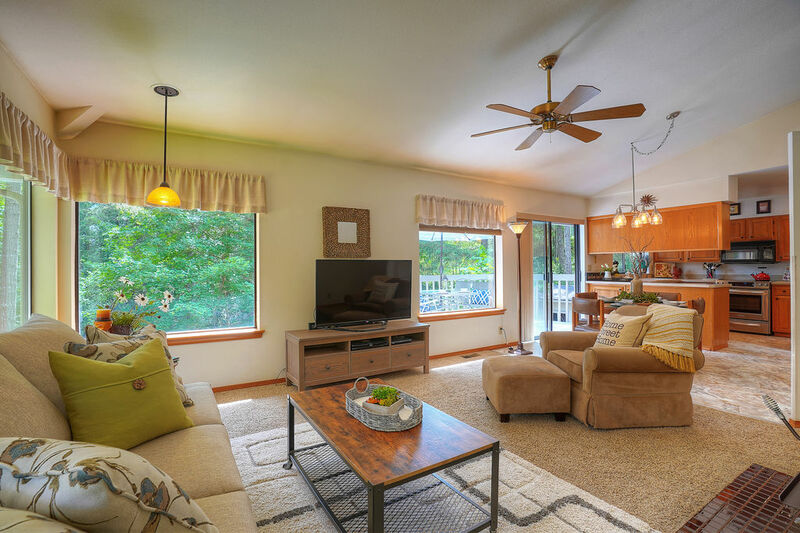 Enjoy being a short 4-minute drive to Highway 16, making it easy to get around the rest of Gig Harbor or head over the bridge to Tacoma and beyond. 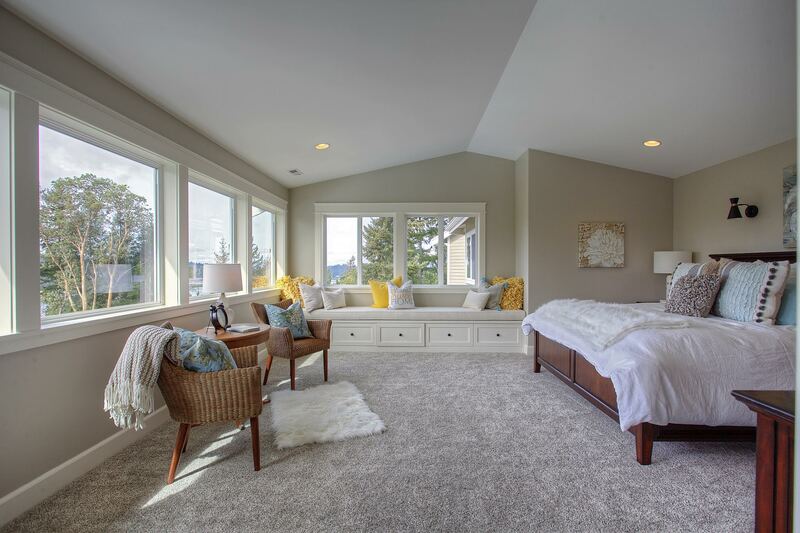 Uptown Gig Harbor is also just a 4-minute drive away, and here you’ll find a myriad of amenities. Places like Safeway, HomeGoods, Galaxy Uptown Luxury+ Theater, MultiCare Urgent Care, Gig Harbor Pierce County Library, Ace Hardware, Rite Aid, several eateries and more are all in the mix. Those who love golf are also in luck—Madrona Links Golf Course is only 9 minutes from home, and the Performance Golf Center is only 2 minutes away.